Written on the train to Córdoba. I felt that sentiment quite often over this past year, though perhaps I didn’t admit it or articulate it half as much as I thought it. One more minute to catch the bus. One more hour to prep a session. One more day to finish a mix. One more week on an assignment. One more month of vacation. One more year with my classmates. It’s been slowly hitting me – it really hit me the morning after graduation. Much like a hangover, it passes with time, but it still hits me from time to time. When it does, I feel it deeply. I feel what I’ll be missing – what I have been missing – since I took that walk across that stage. We’ve been losing them one by one, or a few at a time. They are gone but not forgotten. We know that they’re just an e-mail or a Facebook message away, but they’re still not here. Those who remain behind have taken to calling each other “the survivors.” I, too, am soon to join my friends in their not-here-ness, and then the true test begins. It’s much more than the facilities, or the tech – I’ll miss the Palau and the labs, for sure – but it’s the community that we built in the span of one intense year – a mere ten months, in earnest. The camaraderie, the friendship, the love – the family. Brian was right: it’s a year, but it’s only a year. The flame we kindled together was, as Alfons would say, short but intense (and, as I would say, kind of like me 😉 ). We promise each other that we will stay in touch, but it won’t be the same. There will never be a substitute for sitting at our favourite tables in the cantina, or working feverishly in the labs – our trenches – alongside our fellow creative minds, or having “just one” drink at Las Artes and wondering why it was suddenly 4. There will never be a substitute for seeing everyone’s faces – whether smiling or stressed – every day, or always having a willing ear to hear your latest track, or knowing that the person beside you is going through the same thing as you, or happening by our favourite hangout spots and inevitably meeting at least two or three others there from school. To say that what we had here was special would be an understatement. At the same time as I tell one classmate, “See you in August,” I give a more ponderous farewell to another, not knowing when we’ll meet again. We tell each other to look us up if we’re ever in any given city – Los Angeles, New York, London, or wherever else – and I cross my fingers that my network, my Berklee family, will be able to receive me when I call. …but I still miss them. I still feel the loss. What I may have missed through the duration of my undergrad studies I more than made up for in the intensity of this program. I know that they will always be with me. …but I still wish that I could have one more — just “one more” — year with them. Put your hands together for the Master’s Class of 2014. Photo courtesy of Berklee College of Music. Welcome back to the podium, faithful readers! True to form, I blink my eyes, and another month passes. No, this is still not the long-awaited London update. I promise that I will upload that soon. For now, however, I want to tie up a few loose ends about where I have been and what I have been doing these past few weeks (in case you have not been following my Twitter feed). Just to keep things interesting, let’s do this in reverse-chronological order. As you can see, the countdown to graduation has run out, and I am now a bona fide Master of Music in Scoring for Film, Television, and Video Games (is “Maestro” the correct appellation now?). I will take the time to properly revisit my thoughts and reflections after I have had some more time to process this, but I was proud to take my place amidst my colleagues as we walked across the stage of the Teatro Martin i Soler — one of the first places that we visited on our tour of the Palau complex during Fall Orientation in September — and bid farewell to the school that has fostered and nurtured our creative and academic endeavours over these past ten months. 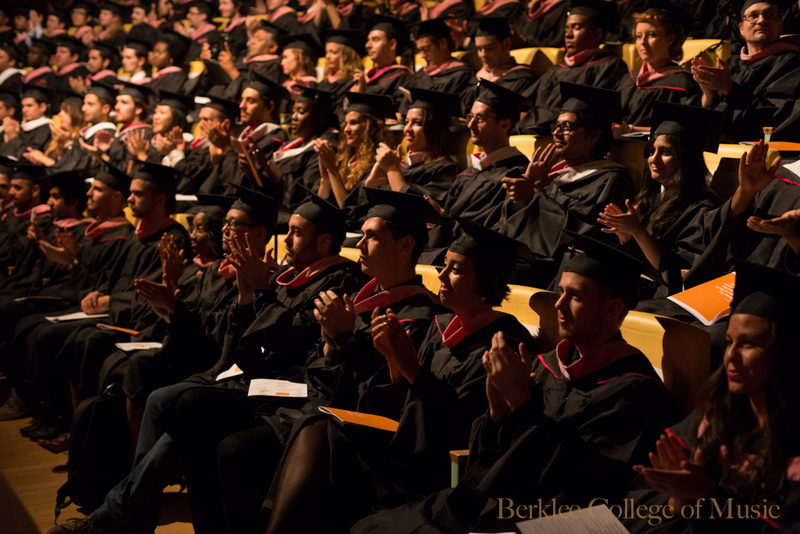 If you happened to have missed the 2014 Berklee Valencia Commencement Ceremony, you can watch it right here, on the podium! Two nights before, I was privileged to participate in the Berklee Valencia Commencement Concert in two acts. The first was a medley combining a traditional Indian song, aptly entitled “Kanada,” with the jazz standard, “Afro Blue,” and the Bill Withers spiritual-like soul tune, “Grandma’s Hands,” in an arrangement written by yours truly for voice, veena, violin, clarinet, guitar, tabla, double bass, piano, and vocal percussion. My ensemble was comprised of members of the Berklee Valencia community of all stripes, from a post-graduate fellow to an undergrad studying abroad, from a Latin GRAMMY® winner to little ol’ me. In the second, I took to the stage with the Berklee Valencia Brazilian Batucada, reprising a performance that we recorded in the second semester with Brazilian singer-songwriter Luiza Sales. In addition to practicing for the performance, I spent the preceding week finishing up a couple of projects, including my contribution to the soundtrack of Olly: Dusty Memories, a video game project by students from ESAT, here in Valencia. As I mentioned in March, I was a member of a group of composers from Berklee Valencia who joined in collaboration with a team of ESAT design and development students to produce a “vertical slice of gameplay” (essentially, an excerpt). I completed one track at the end of the second semester in May, and I was asked to provide an additional piece of music in the third semester. I am told that the team produced a playable demo in time for DreamHack, and that they intend to continue working on the game. Earlier in the week, the video that I scored for my London recording was screened as part of a program entitled, “Composers of the Future,” a collection of our final projects, at L’Hemisfèric (Valencia’s planetarium). It was an honour to have been chosen to have my work publicly represent the Scoring for Film, Television, and Video Games program here at Berklee in Valencia, and a pleasure to hear the work of my colleagues fully realized, synchronized to picture. If getting to be present for the recording sessions at AIR Studios for these projects was phenomenal in and of itself, then hearing the final product was truly a satisfying conclusion. On July 1, I successfully presented my Master’s dissertation, “San, Synth, and Symphony: The Music of Miyazaki’s Princess Mononoke“. I have admired this film since I first saw it in 1999, and have, of course, listened to the soundtrack countless times, but never truly examined it before with a critical lens (which led me to watch the film and listen to the soundtrack probably more times in the past six months than in the previous 14 years). I combined my experience with film studies and musical analysis to conduct an in-depth study of the various auditory cues, clues, and codes that are included in the soundtrack, particularly through the use of orchestration/instrumentation and recurring themes, to create narrative meaning for the audience and to fulfill the composer’s role as a musical storyteller. (Yes, it goes on like that for about 12,000 words.) It will become part of the Berklee College of Music archives, but if you would like to see an unofficial copy, please leave me a comment, send me a message, or otherwise get my attention. The night before my Master’s thesis presentation (never a dull moment, folks! ), I successfully interviewed with Sparks and Shadows, founded by composer Bear McCreary (Battlestar Galactica, The Walking Dead, Marvel’s Agents of S.H.I.E.L.D., Black Sails), to join their team this fall as a studio intern. I’m very excited for the opportunity to participate in the studio of an active composer in the middle of an active production (or three). I consider this an important component in my education — getting to put what I’ve learned about the industry, through both education and experience, into practice — into an experience that truly marks the culmination of my Master’s adventure. I look forward to working hard and learning a lot — and, as circumstances permit, blogging about my experiences! Yes, ladies and gentlemen, Federmusik is going to Hollywood. Next, as I mentioned in my April blog post, I was back in the producer’s chair to record a short cool/action cue, rescoring a scene from Go for Sisters, with its composer, Mason Daring, as my co-producer. For this project, I was very pleased to be working again with my fellow students on the other side of the glass, recording Master’s students Sergio Martinez (percussion) and fellow Canuck Tyler Sasso (guitar), along with undergrad Max Ridley (bass) on this track. Mason is a very experienced producer, and I was glad to have him on my wing for this sortie. 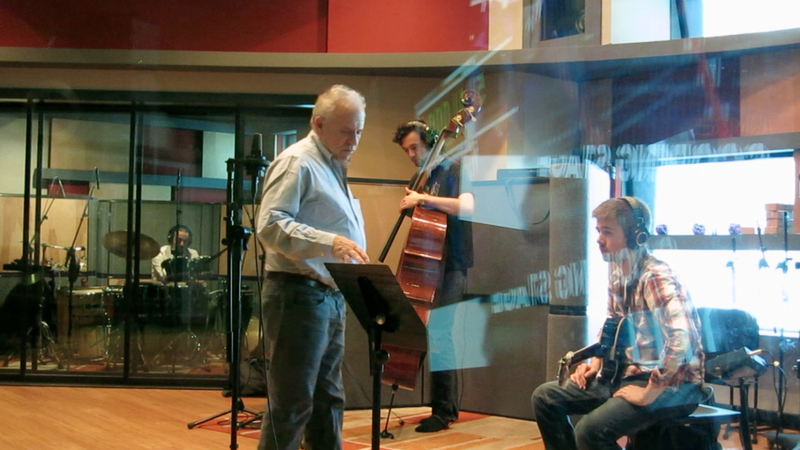 I found him the perfect balance of gentle and direct, and often spoke for me to the musicians during the session. He was also not afraid to give his suggestions, often knowing just the right ingredient to make the track really shine (especially with regards to my guitar parts — a topic that I am now better versed in, thanks to this cue). At the same time as Mason seemed to take control during the session, he was often going to bat for me, encouraging the musicians with such lines as, “It’s a nice part. David deserves this to be on.” Much appreciated, Mason! Mason Daring (centre) coaches the musicians through the chart. Would you watch this series? Tell me in the comments! I capped off the musical countdown with what I called the “Thesis Edition,” in which I released my London recording. I’ll save posting that here for the London update. While all of us fresh graduates are currently pondering that question, mostly in an esoteric sense, I am enjoying some well-deserved and much-needed downtime and can give more of a literal answer. After spending a few days in Barcelona last week actually seeing the city (and not standing in line outside the convention centre), I am off to Córdoba for the end of the Festival Internacional de Música de Cine, Provincia de Córdoba (FIMCC). After that, I plan to spend a couple days in Sevilla, then make my way back to Valencia via Madrid and Toledo. Following my return to Valencia, I will begin closing out my affairs here in preparation for my return to North America. Expect upcoming blog posts in the near future about London and reflections on graduation.